Re: How to apply MBA Distance Learning PGCBM from XLRI Jamshedpur? I wan t to apply for admission in distance learning PGCBM program in XLRI - Xavier School Of Management Jamshedpur so can you tell me how to apply for admission? 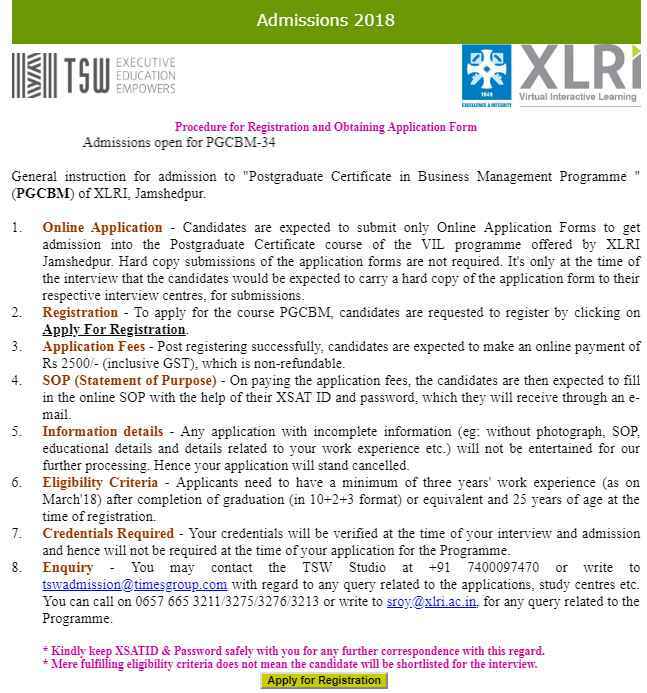 The in XLRI - Xavier School Of Management Jamshedpur invites application form for admission in Postgraduate Certification in Business Management Programme (PGCBM-34). I am telling you the process to get the online application form of admisison. Application Fees - Post registering successfully, candidates are expected to make an online payment of Rs 2500/- (inclusive GST), which is non-refundable.